At the start of this year, we shared our insights into trending destinations and search and exit (redirect onto booking sites) behaviour based on our 2017 data. Half way into 2018, we have identified key changes to inform your business planning and growth activities based on data from our 70 million unique users. We have identified the most popular destinations – by searches, and exits – within the EMEA, APAC, and AMER regions. Within EMEA we have seen no changes in rank amongst the top 10 destinations, however both Turkey and France are seeing a ~5% growth in searches and exits. Within AMER we have seen Italy improve its ranking for searches, and Canada improve its ranking for exits. Within the top 10 destinations, Mexico, Brazil and Canada have the greatest growth in searches, and Mexico and Spain have seen the greatest growth in exits. 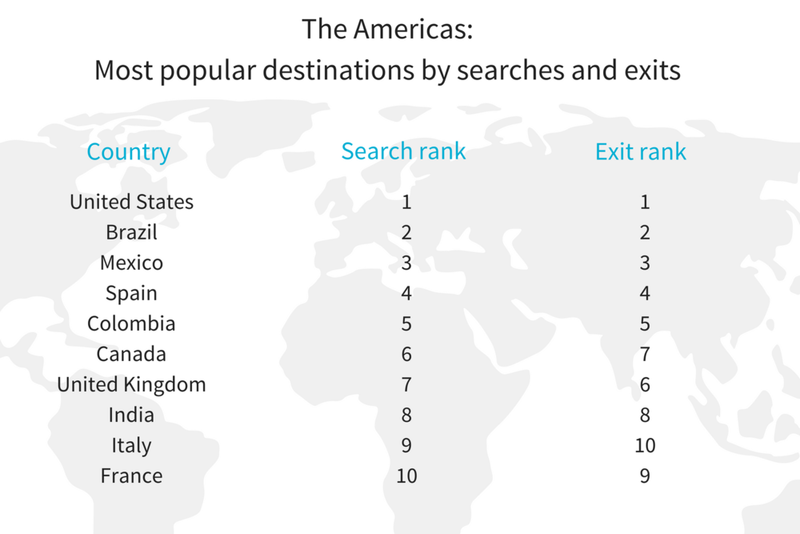 Argentina has also shown substantial growth for searches (16%) and exits (11%) and could soon break into the top 10. 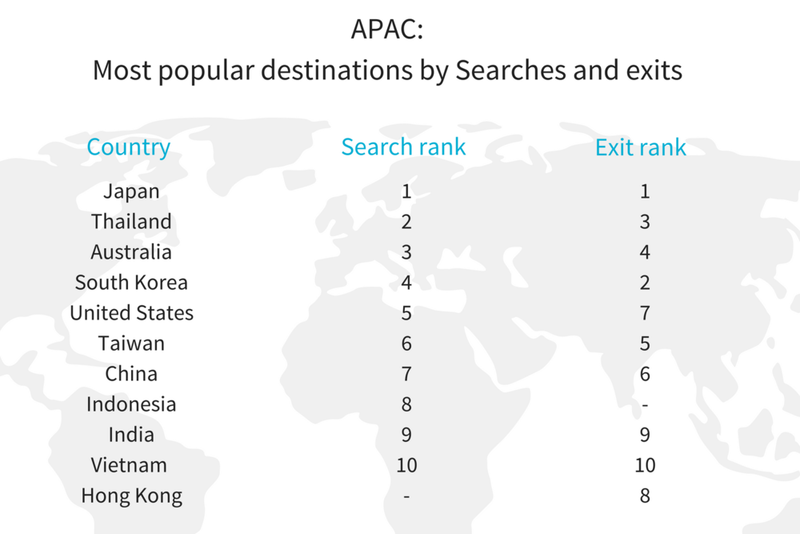 Within APAC, we have seen both searches and exits on routes to India and Vietnam grow significantly. Its +7% growth has resulted in India increasing its search ranking by 2 places, and Vietnam has increased its ranking by 1 (with 10% growth) to enter the top 10 most searched for destinations. It is also worth noting that although the Philippines has not yet entered the top 10, it has increased its exit ranking by 2 places in the last 6 months (now 12th most popular) and could be set to enter the top 10 for both searches and exits in the coming months (with 13% and 17% growth respectively). As well as looking at the most popular destinations overall, we have analysed the top destinations for long-stay holidays (when the outbound and return date are 10+ days apart) by exits. Within EMEA, we have seen Turkey growing not just overall, but also specifically for long-stay destinations with 7% growth versus last year. This has resulted in it improving its ranking within the top 10. The Philippines is also on the rise and looks set to enter the top 10 soon with growth upwards of 11%. Within AMER, Spain and Mexico have improved their ranking, and as in EMEA the Philippines may soon enter the top 10 as it sees continued growth (upward of 12%). Portugal is also seeing extraordinary growth levels (25%) – meaning it could also be a strong contender for the top 10. Within APAC, the Philippines has increased its rank 1 and continues to experience high growth rates of +18%. This also highlights a global travel trend, as the Philippines has grown in exits across the board! India is also experiencing growth of 10%. 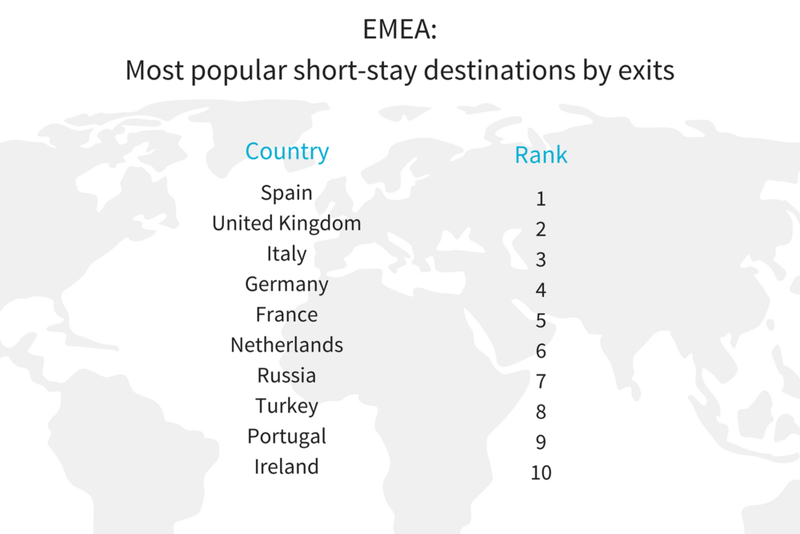 To provide insight into the difference between preferences for long-stay and shorter holidays, we have identified the most popular short-stay destinations (when the outbound and return date are up to 4 days apart) by exits. Within EMEA, we have seen no change in the top 10, however Greece and Poland (currently ranked 11th and 12th) are seeing strong growth and could improve their rankings in the coming months. As expected, the top 10 destinations are all within EMEA for weekend trips – contrasting with the popular long-stay destinations such as Thailand, the US and Indonesia. Within AMER, there is one very interesting change to the top 10: the UK has entered the list. Quite surprising considering the distance, but also a sign the decrease in prices over the last 6 months* and improved connectivity (with available routes with exits increasing by 5% over the last 6 months*) is impacting the marketplace. Additionally, Mexico, Argentina, Chile and Peru are all experiencing growth upwards of 14%. As with EMEA, all short-stay destinations in the top 10 aside from the UK are within the AMER region, which contrasts heavily with the popular long-stay destinations. Within APAC, the Philippines has become an increasingly popular short-stay destination with 15% growth in the past 6 months. Vietnam has also experienced high growth at 17%. Comparing APAC with other regions it is also interesting to note that there is a greater number of top 10 destinations that feature in both the short and long-stay top 10. Whilst the rankings shift for long-stay holidays, the only destinations introduced into the rankings are the US and the UK. By looking at search and exit data, we can identify regional and global shifts in travel planning behaviour. A global increase in January searches – although May and June were the most popular months for searches in the first half of 2017, 2018 has shown a shift with January becoming the most popular month for searches across the board. Greater alignment between searches and exits – in the first half of 2017 we saw a disparity between the most popular months for searches and exits. With the greatest number of exits taking place in January, but search volumes increasing for May and June. This year we have January as the most popular month for both searches and exits – indicating a stronger search intent and stronger correlation between search and exit. Weekdays are the most popular days of the week to search and exit – Mondays, Tuesdays and Wednesdays are the most popular days for searches and exits. With EMEA and APAC users favouring Monday and Tuesday, and AMER users preferring Tuesday and Wednesday. Saturdays are the least popular day of the week for searches and exits - global data highlights that in contrast, during the weekend (specifically Saturday) fewer users are searching and exiting. An overview into what your customers are looking for, and when, as well as insights into the most popular destinations which can help you price routes competitively and identify new opportunities. Up to date insights into customer purchasing preferences indicating the adequacy of that route in terms of flight time, schedule, availability and price. Geo-tagged data, so we know on aggregate where your customers are when they’re searching and when you are losing passengers to a competitor airport or airline. This can help you to understand the catchment areas and plan your marketing campaigns more efficiently. Insights designed for Destination Marketing Organisations, Airports and Financial Institutions to better target and engage with potential travellers and customers. Interested in learning more about our Travel Insight offering?